Years ago, Kirk Hammett described the making of Master of Puppets as a period when the boys in the band were coming out of a phase where they only listed to the most extreme music they could find. You may have noticed the departure in quality between Puppets and its predecessor. Though Glacially Musical is dedicated, primarily to the heavier side of musical spectrum, it's not been uncommon for me to delve into other types of music. If you're following the Instagram Account, you'll see all kinds of interesting records in my home collection. With that kind of a mindset, we turn our sights to veteran Americana Rocker, Sam Llanas. 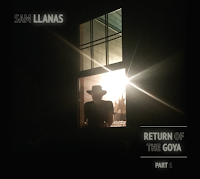 Llanas, formerly of the Bodeans is out there right now getting his Return of the Goya Pt. 1 into your ears. You can check all of that out HERE. Sam was willing to spare some time for us to talk about his touring stories. 1. What’s the right length for a tour? I think Bob Dylan has the right idea. He's been on what he calls the never ending tour for a long time now. Man should be prepared to tour all the time except of course when they're writing or in the studio recording. 2. I've heard some great stories about strange ways of eating on the road. What’s your trick to keeping your belly full while out there? I don't have any tricks per se. Eat when the opportunity arises because it doesn't always present itself. If you come up on something that's not just fast food crap try to take it with you so you always have something on hand. 3. Tell me about the best club you've played? The worst? Names can be left out, or in…whichever. The best clubs out there like the 930 Club in Washington DC are the best because they care enough to hire the best in technical production and people who care about putting on a good show. 4. Whenever I get behind the wheel of a car for a long drive, I always play a Mitch Hedberg comedy album. What’s your routine? On a long drive it’s good to have things to occupy your mind such as music, podcasts, audiobooks or good old-fashioned conversation but for me the real trick is to just resign yourself to the task at hand. 5. How do you settle band fights while in the backseat of the van? A quick Hard Punch to the throat can stop a lot of fights quickly no matter where you are. 6. Tell us about the best response you’ve gotten outside of your home town. One of the best responses I’ve ever received outside of my hometown of Milwaukee was in Paris France. After the show this beautiful Parisian woman came right up to me and said you are very nice to look at and she kissed me very sweetly unfortunately she had to leave too soon. 7. Have you ever played in St. Louis? I have many fond memories of playing in St Louis at Mississippi Nights and then going to Talayna's for a wonderful St Louis Style Pizza.